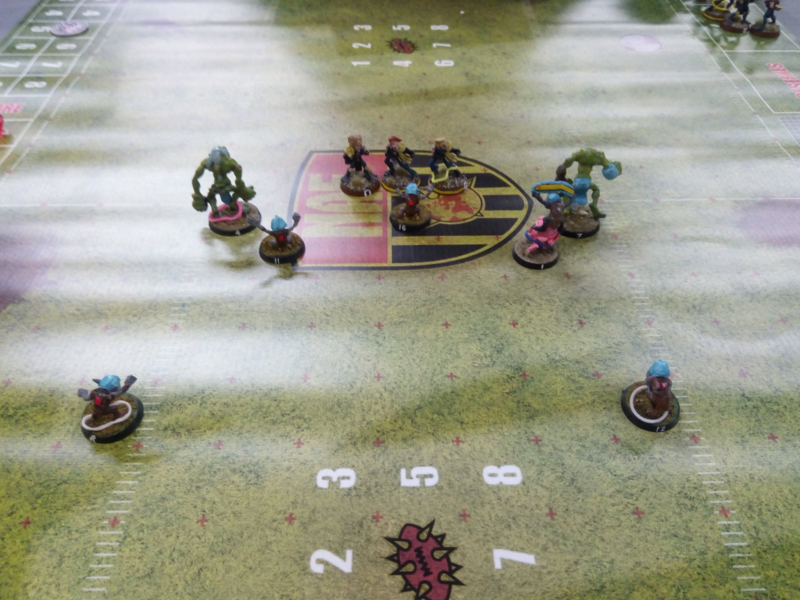 After 82 NAF tournaments it’s always good to find a novel reason for choosing a race for a tournament, so for this one I made a bet with myself – if Wales beat France in the 6 Nations on Friday night, I would take Goblins, if not, then Chaos Dwarves. I also hadn’t tried out Gobbos with the Doom Diver, and I do like the Welsh habit of advertising previous stunty cup winners, so thought I would take on the challenge of being added to that illustrious roster. 16-0 to France at half time and it looked like I might have a successful weekend instead, but then a catalogue of French errors meant that the little guys made the trip across the (free!) bridge instead. I went for 2 fanatics, chainsaw, and a piling on Troll, hoping to reduce numbers and then walk in some TDs. Fink da Fixer also joined the party. Game 1 was against my younger son, Dementor, with Pro Elven Union (as I’m calling them nowadays). He received, and went for a fairly quick TD, but Diving Tackle did for him. Sadly, it only postponed the TD by a couple of turns. Failed to score back, but managed to kill both Blitzers with my chainsaw, before the bribe failed (even with Fink’s reroll!) and he got sent off. Game 2 was AngryHobbit’s Orcs with Ripper. My chainsaw died on a thrown rock on the kick off, then I managed to wipe my fanatics out with each other on a double both down (there was a good reason! ), so it was an uphill struggle. AH was kind enough to offer me a few chances, so it finished 1-0. Goblins were hard work, and became harder in Game 3 – High Elves with an Accurate/Strong Arm thrower! I killed 3 of them in turn 1, but then it went pear-shaped in turn 2 as his Tackle Blitzer killed my dodge that was supposed to be the corner of the cage, and then knocked down my blodge pogoer, popping the ball loose. Sad times! It got worse from there, finishing 6-2, after I got a couple of Doom Diver TDs but he got a lot more, obviously. So what to play for on Day 2? I have 12 casualties, as everything dead is counting, so will be looking to rack that up. 3 wins would put me in contention for the stunty cup, though with experienced stunty coaches in Glowworm, Cornish and Hobnail, that’s not guaranteed either.